The book after all is as essential in its many functional and vernacular aspects and as inspiring in its many serviceable forms and formats as it is in its more poetic evocations. 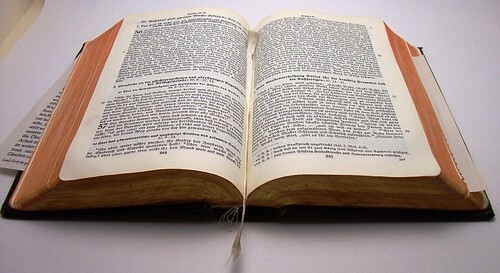 The efficient density of the telephone book, for example, which provides a tactile and visual satisfaction through the thin quality of its paper, a paper which amounts in the bound form to a flexible dense object makes a striking contrast to the pleasures provided by a new notebook, its blank sheets full of promise and opportunity. In its familiar form the paperback novel, impressed with the tacky curve of an outrageously molded form, die-cut, foil stamped, and turning brittle on the same trip on which it is purchased announces its ephemerality without shame, eschewing all commitment from the very first, while the heavy pages of a traditional photo album absorb memory into their dense field and hold it safe, still, silent and waiting. The inexpensive dimestore diary is of another form altogether, making believe there is a life worth noting as a series of secrets whose value derives form the tiny key which locks them in nightly more than from the childish scribblings in which they are generally, briefly recorded; while the crossed and criss-crossed palimpsest of the pocket-sized address bock provides a whole history of a real life, though none of its narrative fullness. Every book is a metaphor, an object of associations and history, cultural meanings and production values, spiritual possibilities and poetic spaces, and all of these are a part of the field from which the artist’s book derives its identity, its shared connections and distinguishing features as a book whose realized forms and thematic intentions are only the most evident aspects of its totality as an idea. This weekend I have been experimenting with two-colored Coptic headbands. 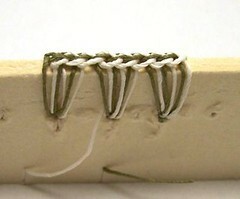 The principle is always the same: Chain stitches along the book boards. These are so straight forward generalizations of the Coptic headband as I have learned to do them that I can’t believe it has not been done before. I don’t know of any written source that covers the making, though. If you know one, please let me know. The names you’ll see below are just my own – probably they already have different names. I’d be glad to learn these names if you know them. 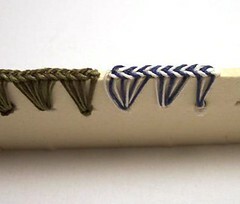 This is the most simple version and no double headband at all – it’s just two colored. This are two versions of what I would call fake double headbands. It is really just two headbands side by side. 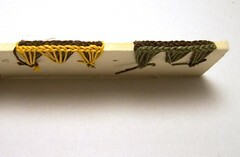 The brown and yellow is done in opposite directions: one (the brown) from right to left and the other from left to right. For the brown-olive version I made them both from right to left. On the left you see the view from outside the boards. 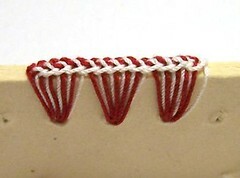 Fake double headbands, seen from inside the boards. This is what I call a poor double headband. 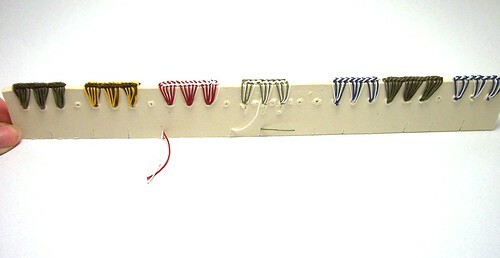 It is a simple headband (white) with the red string additionally looping around. The result is asymmetric. On the left you see it from outside the boards. And this is the poor double headband seen from inside the boards. – The treads are not cut-off properly, sorry. This is what I would call a plain double headband and I think the most beautiful result that I have so far. The blue-white is really the same as the brown-olive that you see at the edge of the picture. It’s just less dense and more evenly woven. This is the view from outside the boards. 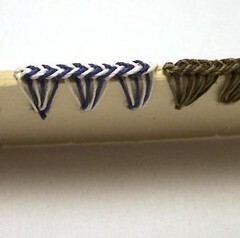 The plain double headband seen from inside the boards. 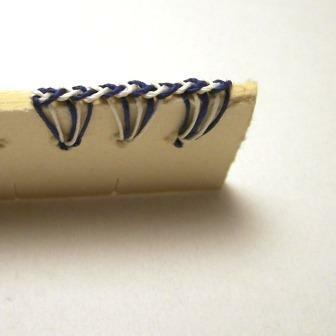 And finally this is what I call a true double Coptic headband: It features chain stitches with two threads, here in two colors, that are truly and symmetrically interlooped. This is the view from outside the boards. 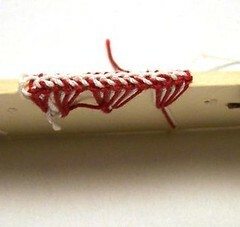 The true double Coptic headband seen from inside the board. So, what do you think, do you like these two-colored headbands? And which one do you like best? 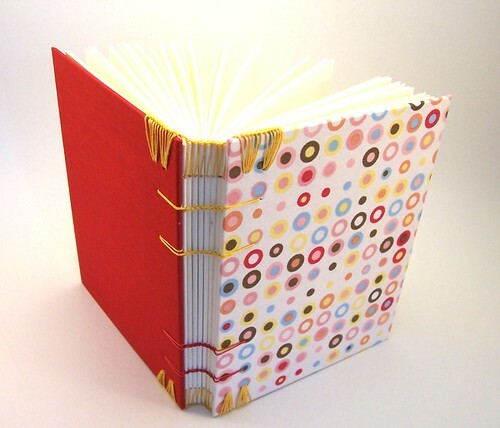 Sorry that I can’t present them on a real book – I spent all the time figuring out how to do them, and didn’t have time yet to fit them on a book. I think they would look best on a book with really thick, maybe wooden, boards. I wish you a good start into this new week. Thanks for reading! Today I’m trying to figure out what I should be doing next. My main question is: Should I start something completely new? Or should I better work out some old ideas? I’m for example thinking about whether I should make an improved, bigger version of “becoming buechertiger” into an edition. But I also have so many new ideas that I really want to try – should I be wasting time with old ideas? While thinking about what to do next, I never got started with doing anything in the past days. So I decided to sort it all out: This morning I made the following diagram that was meant to help me understand how my different pieces of art connect, and what aspects in my previous work were important. My trials to understand where I come from were not so über-successful, though. I can’t help but laugh about my inability to come up with a good way of picturing that. Does that mean that it’s good or bad that I never took a graph theory seminar while still studying maths? Despite the failure of the initial plan I managed to narrow down my 15 ideas to 5 “do immediately”-plans. But I have no idea with what to start first. All you guys out there who went to art school and learned how to do that: Which are the criteria that make you decide for one and against another project? Probably I should simply throw a dice. 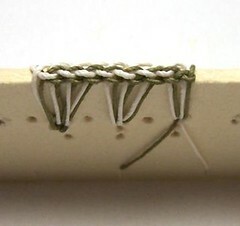 Just to let you know that it’s not forgotten: I mentioned in a comment recently that I am working on a method for double Coptic headbands. I came up with one and a half methods which sort of work. I’ll try to make them more perfect and make a book which is suited to present them. This is one of my many plans for the weekend. Let’s see what I will be able to present on Monday. Have a nice weekend and thanks for reading! Here in Bonn I have had a hard time buying fabric for books. All the textile stores within my reach focus on customers who want to sew their own carnival costumes, so what they offer is mainly cheap stuff with a lot of exaggerated decor. But now a new shop opened not far from where I live and, oh my god, it’s lovely. I managed to stop myself from spending hundreds of Euros and limited myself to the dotted fabric that you see on the picture above, and some ribbons. It was hard to decide what to choose – everything seemed wonderful and perfectly suited to be turned into book covers. I really hope they will make it! – Many shops on this road open and close again only a few months later. Auf der Kölnstraße hier in Bonn hat ein neuer Stoffladen aufgemacht. Endlich mal einer, der nicht ein Schnäppchenmarkt ist, und zwar nicht gerade billige, aber dafür wunderschöne Ware bietet. Ich konnte mich kaum zurückhalten, nicht von allem ein bisschen was zu kaufen. Der Pünktchenstoff oben hat dann aber doch noch seinen Weg in meine Einkaufstasche gefunden, zusammen mit zwei verschiedenen Bändern. Ich hoffe, der Laden wird sich halten, und nicht wie so viele in letzter Zeit gleich wieder schließen! 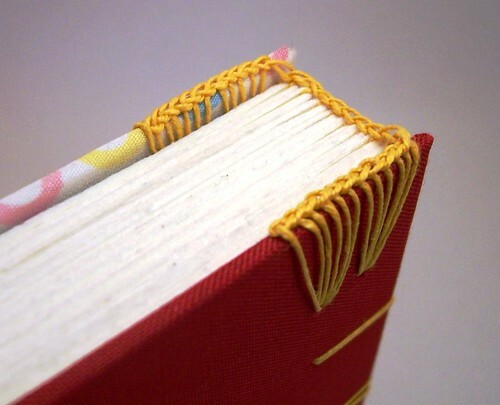 As you can see I practiced with headbands on this book, and I am really satisfied with my work this time. I’ll close with a detailed view on the headbands.